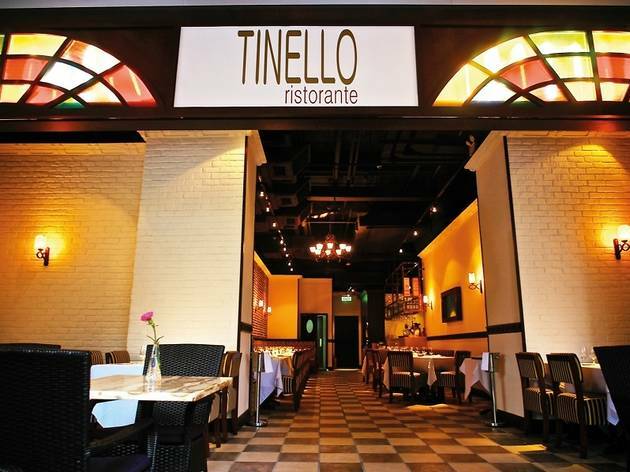 Opened in the recently stripped bare and reconstructed Causeway Centre podium, Tinello occupies a prime restaurant arena fixed up with sweeping high ceilings and an awesome alfresco space. 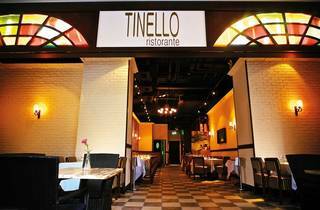 The indoor portion of the restaurant is bucolic Italian with white tablecloths and farmhouse style fixtures. It’s cheesy, but charmingly so and, overall, it’s an easy space to fall in love with. It’s a shame though that we can’t say the same about the food. To start, the antipasti platter ($89) tastes half-hearted – three varieties of cured Italian meats plated with green, black and brown olives, brined caperberries, grilled vegetables, marinated artichoke hearts and a scant littering of cheese. The mozzarella is bland, rubbery and is best left untouched. But the most disheartening things on the platter are the two sticks of dry, store-bought grissini that lie across the plate. The steamed mussels ($88 for half portion) are far more inspired. Served in-shell, the molluscs are cooked until they become close-to-buttery and plumped up with all the flavours of the garlic, wine and herb sauce. The warmed bread basket comes in handy here for sopping up the remaining bits of the garlicky, savoury mussel liquids. For the secondi selection, the restaurant’s veal parmigiani ($178) is a passable effort with a thinly pounded scaloppine layered with grilled eggplant and melted mozza. The three flavours marry well with one another but the overall dish lacks punch or surprise. The lamb tenderloin ($168) is less successful, arriving completely cooked through and difficult to chew and swallow. Then there are dishes that try to be much too experimental for their own good. Case in point is the seafood Cefalu ($149) – a paella-like creation made with basmati rice simmered in saffron seafood broth. It’s an intriguing idea on paper but fails to translate on the plate. Basmati rice’s natural nutty tinge tastes strange in the context of the other clashing flavours and the long grain rice also fails to soak up stock to the degree of medium grain varieties such as calasparra and Arborio. The resulting dish is arid and confusing. The one saving grace here is the generous load of seafood, which includes chunks of white fish, shrimp, calamari, mussels and a massive grilled king prawn to crown the rice. Shop 1, 1/F, Causeway Ctr, 28 Harbour Rd, Wan Chai, 2511 0982. Daily noon-11pm. Dinner for two: around $600.